Batteries - How long do they last? I’ve been trying to find the best batteries for a small handheld GPS that I use. This is a Garmin Geko 201, which I chose for its miniscule size and weight. I used a data logger to measure battery voltage with the GPS unit sitting on a window-sill where it has a partial view of the sky. However I was concerned that the measurements are a bit unreliable since the GPS flashes a low battery warning and turns itself off when it thinks the battery is too low. Also it may be possible that varying satellite positions may affect power consumption, particularly as I have the GPS set to use EGNOS (Euro WAAS) which may depend on which satellites are in view. So instead of using the GPS to measure battery performance I decided to use a torch (flashlight in USian). The nearest one to hand was a Peli Versabrite. (6000 CP, 5 Lumens, 2xAA, 0.6A, 1.8W). I used AAA batteries instead of AA since the GPS takes AAA batteries. 2 x AAA in Peli Versabrite. Light output drops to zero when the voltage drops below 1V. Measurements were over several days. Temperatures varied. 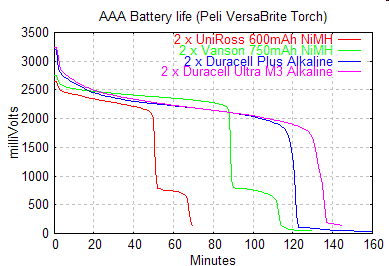 600 mAh NiMH had been through more charge cycles than the 750. Only one measurement of each type, not statistically valid? Data logger was a Pico DrDAQ (limits accuracy). 1.2V NiMH give working volts as good as 1.5V Alkalines. Unexpectedly, 750 mAh NiMH lasts twice as long as the 600 mAh. The Duracell Ultra M3 is only about 12% better than the Plus. NiMH pairs fail at different times, hence double knee graph.